XUV300 is the latest entrant in the compact SUV segment. With its stunning looks and wide range of high-end features, XUV300 has emerged as a formidable contender in the sub 4-meter compact SUV segment. 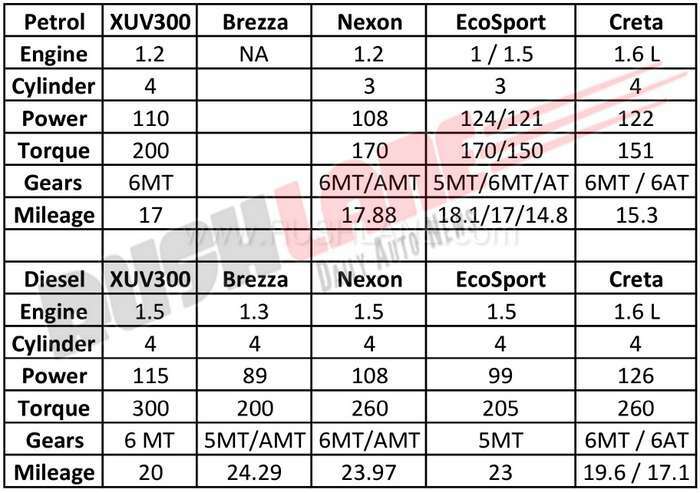 To understand how it will fare against rivals, here’s a quick comparison between Mahindra XUV300 vs Maruti Brezza, Ford EcoSport, Tata Nexon. Dimensions Mahindra XUV300 is 3995 mm long, 1821 mm wide, 1617 in height and has a wheelbase of 2600 mm. This makes XUV300 the widest car in the group and also the one with the longest wheelbase. Ford EcoSport is the longest (3998 mm) and also the tallest (1647 mm) in the group. Tata Nexon has the highest ground clearance of 209 mm whereas XUV300 has the lowest at 180 mm. Maximum boot space is offered by Ford EcoSport at 352 litres whereas the lowest is that of XUV300 at 265 litres. 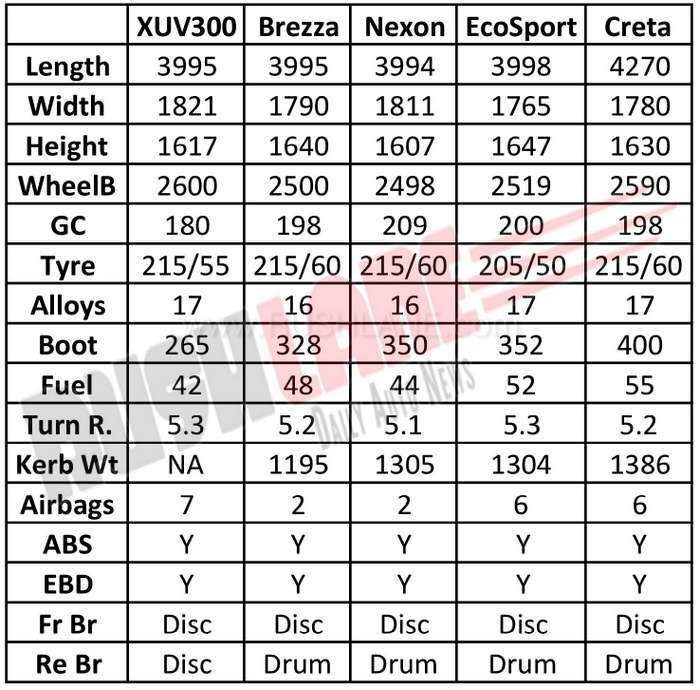 Wheels and braking – Mahindra XUV300 and EcoSport have 17-inch alloy wheels whereas Brezza and Nexon come with 16-inch alloy wheels. A great thing about XUV300 is that it has disc brakes on all four wheels, which is a segment first. Brezza, Nexon, and EcoSport have disc brakes at the front and drum brakes at the rear. Engine and transmission – Mahindra XUV300 petrol variant is powered by a 1.2-litre engine that delivers max power of 110 hp and max torque of 200 Nm. Engine is mated to a 6-speed manual transmission. Nexon also utilizes a 1.2 litre petrol engine that delivers 108 hp / 170 Nm. Ford EcoSport has two petrol engine options, a 1.0-litre unit and a 1.5-litre unit. Brezza currently does not offer a petrol variant. The only drawback for XUV300 seems to be the lack of automatic transmission, which is being offered by both Tata Nexon and EcoSport. Mileage is almost the same for XUV300, Nexon and EcoSport in the range of 17-18 kmpl. Mahindra XUV300 diesel variant has a 1.5-litre engine that delivers 115 hp of max power and 300 Nm of max torque. This makes it the leader of the pack in terms of power and torque output. Engine is mated to a 6-speed manual transmission, which again can be an issue, as rivals Brezza and Nexon offer automatic transmission. With its powerful engine, XUV300 has to compromise on fuel efficiency as well. 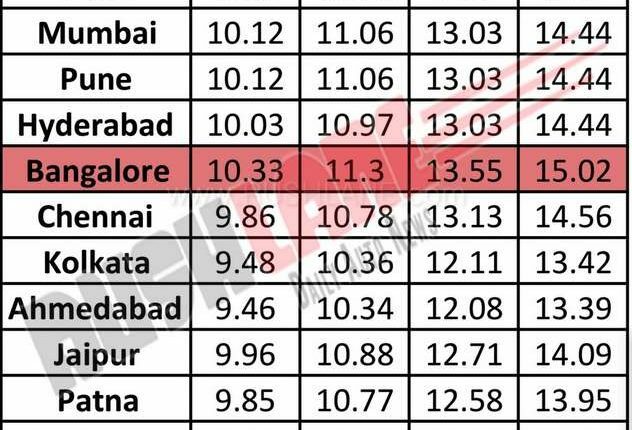 Its mileage of 20 kmpl is the lowest in the group. Security features – New XUV300 gets top marks for safety, as it offers segment leading 7-airbags. All four SUVs come with standard security features such as ABS with EBD, engine immobilizer, speed sensing door lock, seat belt reminder, cruise control, front fog lamps, etc. 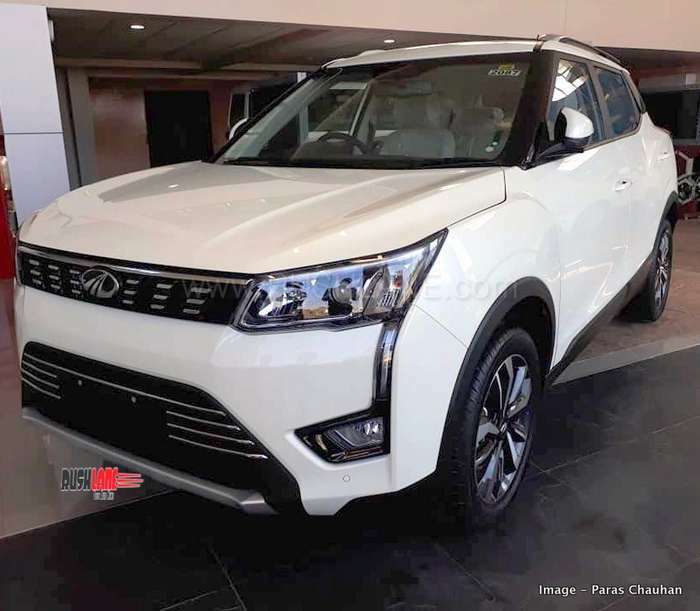 Pricing – Mahindra XUV300 petrol prices range from Rs 7.9 lakhs to Rs 11.49 lakhs. Diesel XUV300 price range from Rs 8.49 lakhs to Rs 11.99 lakhs. All prices are ex-sh. 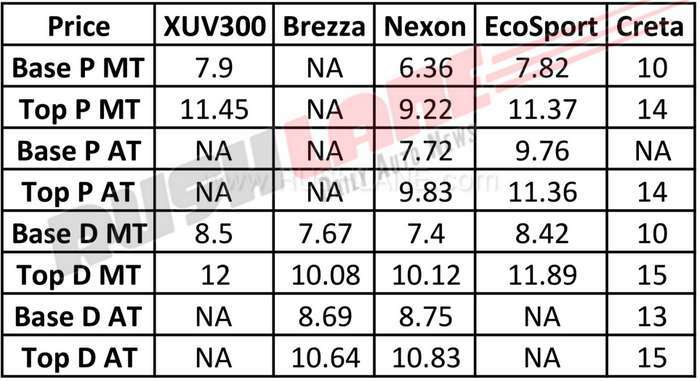 This implies that both petrol and diesel XUV300 will be costlier, as compared to rivals. 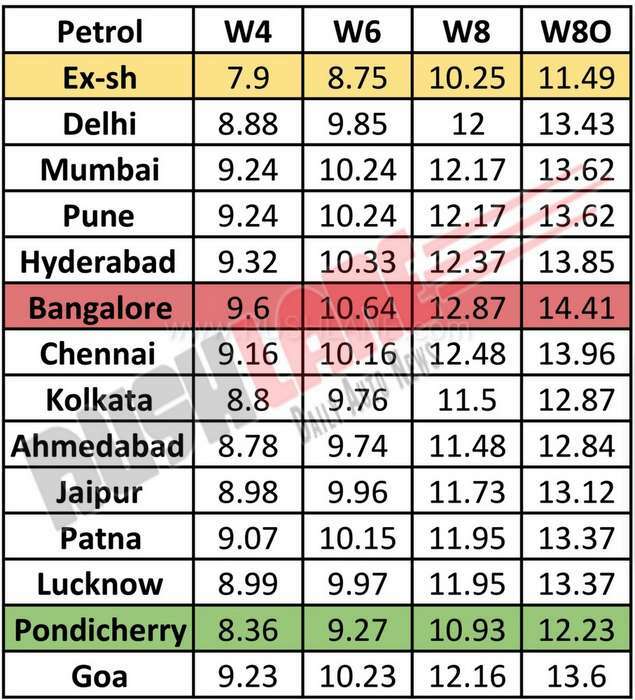 On road prices of Mahindra XUV300 are mentioned in the table below. 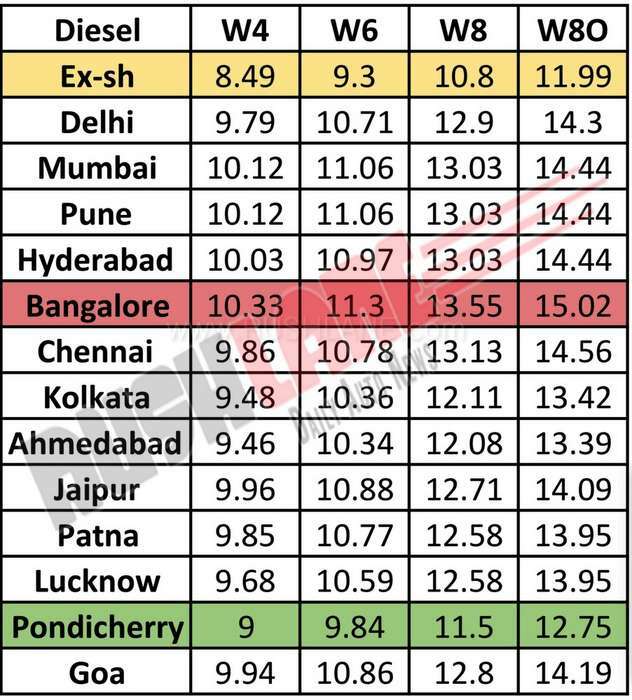 On road prices of diesel variant in Rs lakh. On road prices of petrol variant in Rs lakh.